Packing list envelopes are commonly used in shipping product to hold the customers copy of the packing slip to the outside of the box. This allows for quick identification of the location of the packing list. Packing list envelopes come in many sizes and can hold a range of documention including customs documentation. 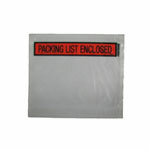 Boatman Marking has a wide variety of packing list envelopes and other shipping supplies and labels. Please give us a call if you have questions.